Warmup DCM-Pro provides a modern solution to electric underfloor heating, allowing for easy installation, easy purchasing and a great thermostat for controlling the heating throughout your home. We sell a wide range of Warmup products at Atlas Ceramics, such as thermostats, insulation boards, heating mats, and we also sell the Floor Heating System. This is a complete electric underfloor heating system that comprises three separate products, and it’s the ultimate way to get efficient underfloor heating in your home. Here’s everything you need to know about the system to help you decide whether it’s right for your needs, and we’ll also be happy to answer any questions you have about the system or any of Warmup’s other products. What Does The System Consist Of? Together, these provide a highly efficient electric underfloor heating system for your home. It is a simple and effective option if you want an efficient system but you don’t want to buy the parts separately. 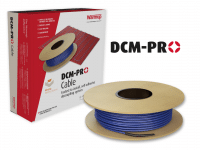 The DCM PRO comes with a number of benefits that could make it a good option for your underfloor heating system. The system is designed so that all three parts work together perfectly, and it is therefore quick and easy to install. It uses less adhesive than other systems, which saves money and time. It has a very high heating output, meaning this could be a good option for your primary heating source. The system comes ready to tile, saving you more time during the installation of the kit. It has an impressive 30-year warranty as well as the SafetyNet™ Installation Guarantee, so you know you are getting a system that will last you a long time. When you use the ¼-inch Warmup Insulation, the system has the lowest consumption cost. When you use the Warmup 4iE Smart WiFi thermostat, the system has the highest efficiency. The membrane has anti-fracture protection. Overall, it is one of the best systems you can get to heat your home. Here are some more details about the different parts that make up the complete system. The Membrane is one of the most important parts of the system. This is an anti-fracture membrane that is used for underfloor heating systems, and it provides protection for the cable. Cales can be damaged by walking on them or by things falling on top of them, and with this anti-fracture membrane in place, damage is less likely to occur. 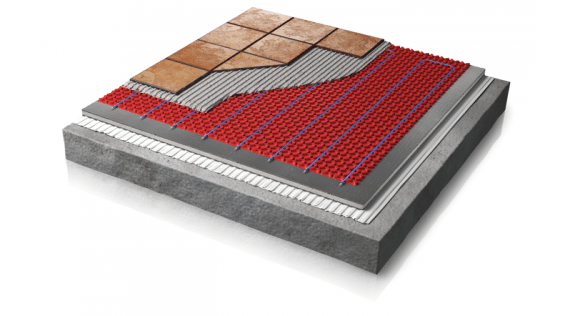 The membrane can be installed on subfloors made from both cement and wood. When installing it, you can use any tile adhesive, whether modified or unmodified. The patented design of the membrane allows more adhesive to connect to the cable, and this leads to an even heat distribution. You can also cover it with self-levelling mortars (SLUs) if you are using small-format tiles or other types of flooring like LVTs. The membrane is TCNA-tested, it has been tested to ANSI 118.12 standards, and it also did very well on the Robinson test (ASTM C-627), making it the highest-rated membrane. The Cable is laid on top of the Membrane, and the membrane comes with pre-spaced channels for this purpose. The cables are spaced at 3 or 4 inches apart, and this provides higher flexibility for heat outputs so you can use it for primary heating as well as secondary heating. The cable is durable while remaining flexible. It has an ETFE inner jacket, which provides high heat output, and a PVC outer sleeve, which protects the cable as well as making installation easier. The 4iE WiFi Smart Thermostat is quite simply one of the best thermostats on the market. This advanced thermostat connects to your home WiFi, and you can then control it from anywhere you can get an internet connection. You can also download the MyWarmup app to control the thermostat from your phone. It also uses SmartGeoTM technology to work out how far you are from your home and set the heating accordingly so that your home is warm when you arrive. You can also manage all the different heating zones in your home using the app from wherever you are. In addition, it has a stylish design and a large touchscreen display that makes it easy to set up and use. You can get 40% off your Floor Heating System when you purchase it today from our store. Atlas Ceramics is for a limited time only selling all Warm up products with this huge discount, so act quickly and don’t miss out! Unless you have a lot of DIY experience, you would probably be best off hiring a plumbing professional to install your system. Although it is designed to be quick and easy for a professional, it may be difficult for you to install it yourself without previous experience. Youtube videos can only help you so much! Warmup provides a detailed installation manual when you purchase the system, and you can also watch Warmup’s detailed installation video here. The innovative Floor Heating System is one of the best solutions if you want to get an all-in-one underfloor heating system for your home rather than buy the different parts separately. Buy yours today directly from our online shop, or contact us for more information on the system or any of Warm up’s products. Call us today for details on the areas where it might be useful, advice about fastest way of tiling over it, our fast delivery options, current deals and offers.